Your goal is to get the variable that you are solving for by itself on one side of the equation. 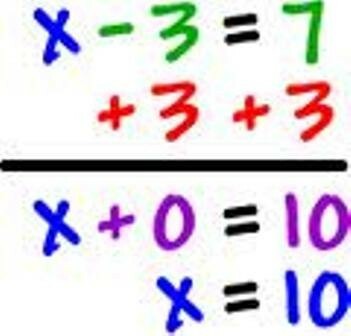 To eliminate a term on one side of the equation, you use the opposite mathematical operation. Whatever you do to one side of the equation, you MUST do to the other side of the equation. This keeps the equation balanced! 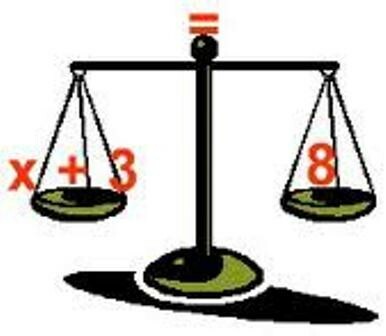 Always check your answer by substituting the value back into the original equation. 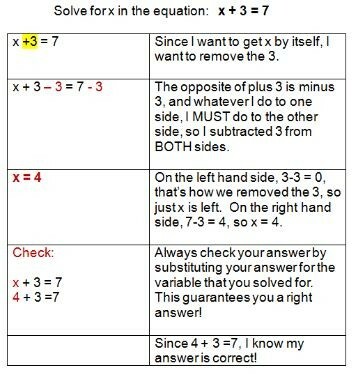 Solve for x in the equation: x + 3 = 7 Since I want to get x by itself, I need to remove the 3.
x + 3 - 3 = 7 - 3 The opposite of plus threee is minus three, and whatever I do to one side, I must do the the other side. So I subtracted 3 from both sides. x = 4 On the left side, 3 - 3 is 0; that is how we got x by itself. On the right side 7 - 3 is 4 so x = 4. Since x is 4 I substitue 4 for x and my equation reads 4 + 3 = 7, 7 = 7. So my answer is correct.